Home Women's Health Emergency C-Sections: Reasons & What Happens during C-section? As much as we all wish for a labor and delivery that is smooth and without complications, resulting in a painless vaginal delivery, unfortunately that is not always what happens. Sometimes, due to a variety of reasons, a C-section might be needed in order to ensure the labor proceeds in the right way. In other cases, should serious complications arise, an emergency C-section could be needed to ensure the health of both mother and child. What Is an Emergency C Section? What Are the Reasons for an Emergency C Section? What Happens during the C-section? A cesarean section is a medical procedure in which the surgeon makes an incision in the abdomen of the mother and removes the baby. C-Sections can be planned in advance if the mother or child have medical conditions that call for it, but these are not considered an emergency. An emergency C-Section is only used if the situation calls for it and there is no time to plan it ahead of time. Fetal distress is one of the major causes for an emergency C-section. Fetal distress is normally classified as any issues the baby might be having during delivery. This includes things such as a heartbeat that is too slow or a decreased amount of oxygen. Certain birth defects may cause the delivery to switch from a vaginal birth to a cesarean. This includes conditions where the child’s organs are outside of the body cavity, and was not fixable through prenatal surgery, or just defects that have altered parts of the body in a way that cannot be delivered properly. Sometimes babies can develop to a point that they are too large to fit through the birth canal. When this occurs, an emergency C-section becomes necessary to ensure that both the mother and child can survive delivery. If your baby is breech, meaning that your baby is flipped so it is trying to be born feet first, then an emergency C-section might be needed if all other methods of trying to turn the baby fail. Additionally, if the baby is in transverse position with its shoulders aimed towards the birth canal, an emergency C-section might also be needed. These two issues are some of the more serious reasons for an emergency C-section. In placenta previa, where the placenta has shifted to cover the cervical opening, traditional vaginal delivery becomes impossible. Having issues with the placenta can create issues with delivery and lead to dangerous amounts of bleeding during delivery. Additionally, umbilical cord issues can trigger a C-section. This happens when the umbilical cord is wrapped around the baby’s neck, has been crushed during labor, or has been tied into a knot at some point during labor. If the cord starts to deliver before the baby, this is also cause for concern as cord prolapse could lead to a crushed cord. As the umbilical cord delivers oxygen to the baby, it is vital that if something is wrong with the cord, the baby is evacuated out of the womb as fast as possible. Sometimes, despite all the pushing in the world, labor simply does not progress the way it should. If it is taking too long, or has stopped altogether, it can be a reason for emergency C-section. Labor is not all about the baby! If you begin to exhibit signs of extreme exhaustion or dehydration the doctor might recommend and emergency C-section. In addition, other maternal health concerns such as trouble breathing, risk of heart attack, among other things will also trigger an emergency C-section. Regardless if the cesarean procedure is planned or an emergency, all C-sections will require the use of anesthesia. While most doctors would prefer to give you the option of an epidural or combination spinal epidural so you can stay awake and alert during the procedure, there may not be time with an emergency procedure. If that is the case, you will probably receive typical anesthesia and be put to sleep during the procedure. While being prepped for the procedure you will be given a catheter into your bladder to relieve the need to urinate, and you will receive an IV drip in your arm with an oxygen mask. After that, you will have your belly shaved and rubbed with an antiseptic to clean the surgical area. Finally, a screen will be placed around your chest so that you cannot see what is happening. Be forewarned, there will likely be a huge team of people in the room surrounding you and all working at once. This can be very overwhelming, especially in an emergency situation. However, most hospitals will allow your partner to be with you during the procedure, if you are awake. Once you are prepped for surgery, the surgeon will make an incision on the waistline of your abdomen, near the bikini line. Most women report no pain at all, though some do report the sensation of tugging. The baby will be born within five to ten minutes with the placenta following shortly after. If you are awake, your child will be given to you almost immediately, unless it needs to be checked over by the medical staff. While you are cuddling with your baby, it will take another half an hour, on average, to stitch up the cut on your stomach. The recovery after an emergency C-section is much different than after regular labor. Typically, after surgery you will be taken out of the surgery theater and into a room for recovery. A midwife or other medical professional will monitor your health until you have recovered enough to be moved to a normal ward. Most hospitals will allow you skin-to-skin contact as soon as possible, and this is when, if you have not already, you can breastfeed your baby. 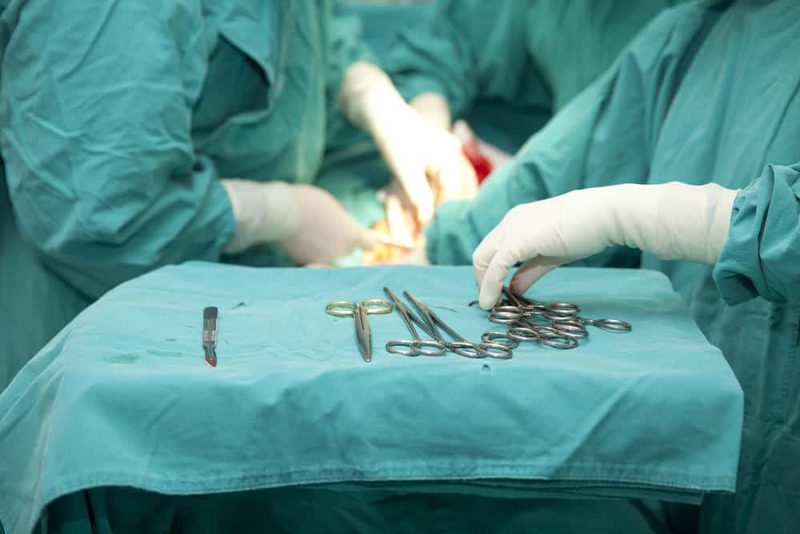 Recovery from the surgery can take longer than a vaginal delivery and you will probably be in the hospital for a day or longer. You might also experience some emotional reactions after your C-section. It is important to discuss with your doctor what went wrong, and to come to terms with any disappointment you might feel about not having a vaginal birth, or potentially not being awake during the birth of your child. Next articleWhat Kind of Baby Shower Cake Sayings are Most Popular?